Congratulations to "Jemi F" and "Kai", the winners in Cate's giveaway. Thank you to all who participated! First grade teacher and single mother Alexa Harris is no stranger to struggle, but for once, things are looking up. The school year is over and the lazy days of summer are here. Mini-vacations and relaxing twilight barbeques are on the horizon until Alexa’s free-spirited younger sister vanishes. Ransom calls and death threats force Alexa and her young daughter to flee their quiet home in Maryland. With nowhere else to turn, Alexa seeks the help of Jackson Matthews, Ethan Cooke Security’s Risk Assessment Specialist and the man who broke her heart. With few leads to follow and Abby’s case going cold, Alexa must confess a shocking secret if she and Jackson have any hope of saving her sister from a hell neither could have imagined. Music is a huge part of my writing process. I typically listen to Pandora or YouTube and compile a collection of songs that I feel represent my characters or the situations they face as the novel unfolds. It’s a rare occasion that my creativity demands quiet (And that’s a good thing. I’m a mother of two boys. Quiet doesn’t happen in my house.). Here are a few of the songs that ‘spoke’ to me while I created Jackson and Alexa’s story! 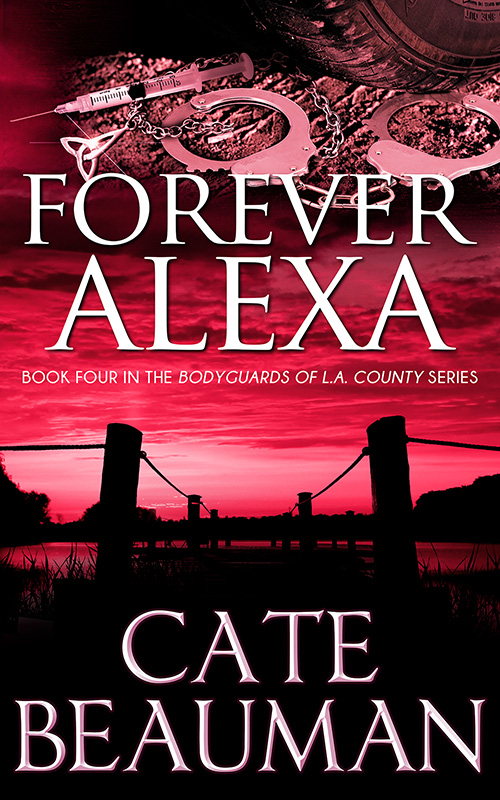 Cate will be giving away 2 digital copies of FOREVER ALEXA to 2 lucky commenters. “Wrong again, Sister Alexa,” the familiar mechanical voice said. She rushed to her feet, grabbed the heavy wooden baseball bat with a trembling hand, and hurried to the entryway to check the lock as her heart rate soared. “Twenty hours or we take Olivia next.” The line went dead. Alexa gasped for breath as a terror like she’d never known constricted her chest. Not Livy. Not her Livy. She collapsed on the bottom stair in the landing, listening to her daughter’s sweet voice as she continued to play in the next room, oblivious to the danger and turmoil destroying their lives. Did you enjoy the excerpt? You can read the first three chapters on my website, www.catebeauman.com, or you can finish the whole book here! Cate currently lives in Tennessee with her husband, their two boys, and St. Bernard, Bear. She is the author of the best selling romantic suspense series, The Bodyguards of L.A. County. Before her career as an author, Cate worked in special education for 12 years. Cate Beauman’s newest release is available now through Amazon and Barnes and Noble. Visit www.catebeauman.com for more information and to read excerpts from her best selling series The Bodyguards of L.A. County. Giveaway ends 11:59pm EST June 9th. Please supply your email in the post. You may use spaces or full text for security. (ex. jsmith at gmail dot com) If you do not wish to supply your email, or have trouble posting, please email maureen@justromanticsuspense.com with a subject title of JRS GIVEAWAY to be entered in the current giveaway. This sounds like a great book! Thank you for the giveaway! Sadly, I'm showing my age - I only recognized two names on the list of soundtracks! 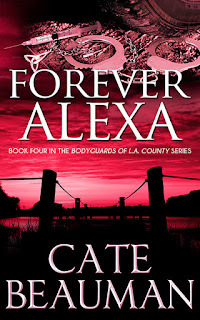 Cate is a new to me author and if the excerpt for Forever Alexa is any indication, I've been missing some good books. Adding to the list. Thanks for the chance to win. Liking what I am seeing so far... looks like I need to add this book to my want list. I've got a lot of reading to catch up on. I enjoyed the excerpt thank you & I just love the covers. Congrats to Cate on the new release! Sounds awesome ;) Thanks for sharing! I haven't read any books from this series. In fact, this is the first time I learn about them. I love each of the titles for each of the books. I need to start reading this series. Thanks for the interview. Without it, I would not have learned about this series. I love this series! Thanks Cate for writing truly engaging romatic suspense. The mystery aspect of each novel is just as compelling as the love story.